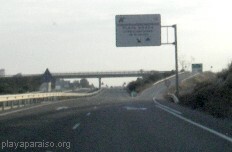 On leaving Murcia (San Javier) airport at the main exit go directly across the roundabout and follow this road for about 2km to the junction with the A37. You want to go left. So go across the first roundabout, through the underpass and then around to the left to join the A37, following the signs to Cartagena. Continue on the A37 for approximately 14 kilometres and then take junction 800 on to the MU312 towards La Manga. Join the MU312 via a slip road. This junction is difficult, but just follow the La Manga signs. At first it looks as if you are re-joining the A37, then there's a junction with no slip road (TAKE CARE HERE - STOP & CHECK FOR ONCOMING TRAFFIC BEFORE YOU JOIN), then make sure you get into the correct (centre) lane for La Manga. This takes you over a flyover, before dropping you down to join the MU312. Beware, as you go down there is a poorly signed and blind 'Give Way'. Continue along this road for approximately 14km, passing exits for La Union, Llana del Beal, La Manga Club, Mar de Cristal and Calblanque. Take the turning off to the right signposted for Playa Honda and Playa Paraiso. This takes you up onto a flyover. Go over this and follow the road down to a T-junction. Turn left onto the service road (look both ways). After about 1km (past the Playa Honda turning) the lane ends with a stop sign. You turn left here, into Playa Paraiso, across two lanes of traffic.